What is the new Poor People’s Campaign? It’s a national movement that renews Martin Luther King’s campaign against racism, poverty, and militarism, and adds environmental degradation to the list of problems. Rev. Dr. William J. Barber, is a pastor, a well-known activist, speaker, author, and North Carolina’s NAACP president for ten years. Rev. Dr. Liz Theoharis is co-director of the Kairos Center at Union Theological Seminary, NY. 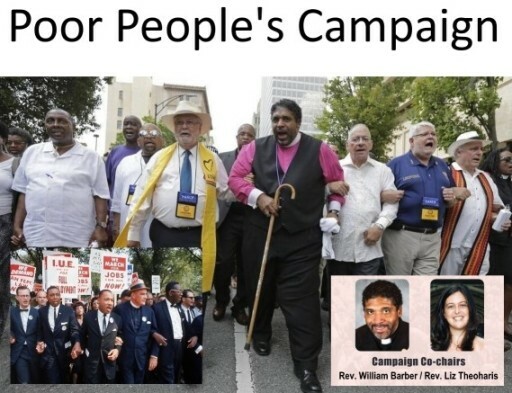 They are travelling nationwide to advance the campaign by working with inclusive state-level organizations that are eager to stand up for justice and morality. Barber inspired 800 energetic people when he spoke at Topeka’s First United Methodist Church August 21. He also trained two dozen activists who are organizing others in preparation for rallies and trainings in KS January-April 2018 building toward a national rally in Washington D.C. in June. Kansans are making plans to go. We are an Anabaptist-Mennonite church dedicated to following Jesus Christ, committing ourselves to radical and biblical spirituality, living in relational and accountable community, seeking Christ's peace within and in the world.